Researchers in Singapore have developed a new liquid biopsy approach. Designed to specifically detect colorectal cancer in its early stages, the new diagnostic technique promises to enable a personalized approach to cancer treatment without invasive tissue biopsies. Early detection of many cancers is often the leading factor for achieving successful treatment outcomes. The gold standard for identifying the type and extent of a cancer is a tissue biopsy, in which a small sample of tissue is taken from the suspected tumor and histologically examining. Depending on location, biopsy procedures can be painful, and if the tumor being tested was first detected by palpation or imaging, it may already be so large that the disease is well advanced. To reduce the pain of biopsies and improve the chances for early detection, researchers from that Institute of Bioengineering and Nanotechnology (IBN) at Singapore’s Agency for Science, Technology and Research (A*STAR) have developed a liquid biopsy, according to a recent press release. 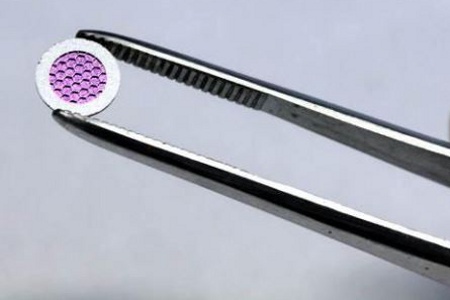 The new device is designed to filter a small blood specimen through a special sieve, isolating free-floating cancer cells that may have detached from a tumor. Specialized for colorectal cancer diagnosis, the system takes the cells that have been filtered by the sieve and tests them for biomarkers specific to the disease. The novel microsieve device uses a packed pore array with 105 pores per sieve, according to a study published by the team in the journal Lab on a Chip. Shown to be effective with several different cancer types, the microsieves exploit differences in flexibility and size between the circulating cancer cells and blood cells. The cancer cells are trapped in the sieve, but the blood cells are able to pass through the device, allowing a sample to be process in as little as 5 minutes, according to the press release. In addition to the recently patented sieve technology, the test uses a refined polymerase chain reaction (PCR) assay to detect mutations in the captured cells, according to another paper published by the team in Molecular Oncology. The PCR-based assay specifically detects the KRAS and BRAF mutations, which are currently being studied as part of the clinical standard for patients receiving chemotherapy. Using the newly developed tests, the researchers were able to identify the KRAS genotype 84.1% of the time and the BRAF genotype 90.9% of the time. These high rates of success, along with the patented technologies in the device, have made it attractive to industry and enabled it to be licensed for development. “IBN is interested in developing medical technologies that can make a difference to healthcare. We are excited about our liquid biopsy approach, which could make it easier for doctors to check and administer the appropriate drug treatment for cancer patient. Our technologies have been validated by Fortis Surgical Hospital and have been successfully licensed for clinical applications,” Professor Jackie Y. Ying, IBN executive director, said in the press release. The benefits of liquid biopsies are recognized by many research teams who are avidly pursuing the approach. For example, a liquid biopsy for prostate cancer detection was recently introduced by a research team at Vanderbilt University.